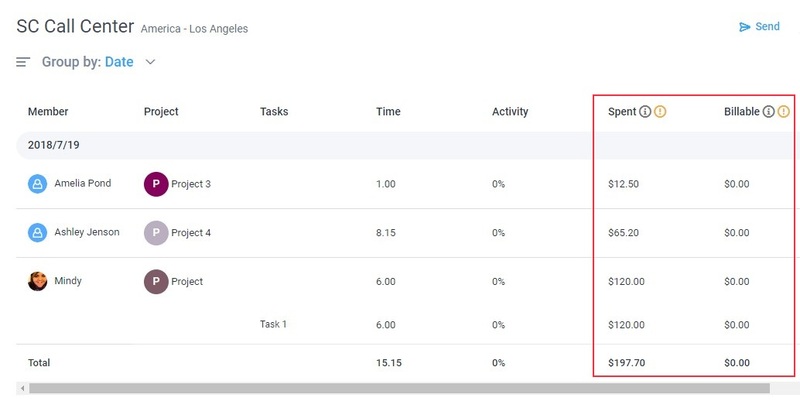 You can now see how much your team members have earned over a given period, as well as how much your clients will be invoiced for their work, directly within the reports. Employees can click on the “Me” reports tab to access their own “spent” amounts. Click on the “Reports” tab on the left sidebar. Select the report type you want to view. You can see the spent and billable columns on the Time & Activities tab as well, you just have to enable them first. Enable the “Show spent” and “Show billable” columns as desired. 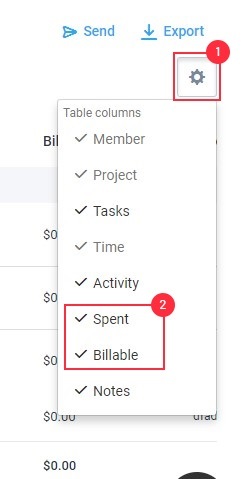 After that, the spent and/or billable columns will appear on the time and activities tab. Reports can be exported as a PDF or CSV, allowing you to keep local records of the work hours and spent amounts. You could also send reports through email if you wish.